Halloween is a hoot — let’s just get that out of the way. But for a seemingly-superficial holiday (dress up and get candy/get drunk), there’s quite a bit going on behind the scenes culturally. And for those of us in the branding world, that’s even more intriguing than the sweets (though less delicious). 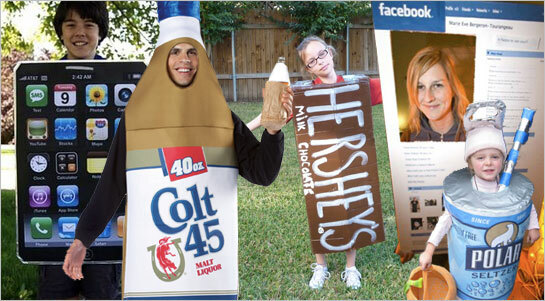 This Halloween, we’ve noted the increasing trend for Trick-or-Treaters and Halloween partygoers to forego the traditional fun and/or scary character costumes, and don brand-specific consumer product attire for their once-a-year holiday getups. More and more Xbox consoles, Hershey Bars, Facebook pages, iPhones, and Schlitz beer bottles are sprouting arms and legs each year.